Well, today is not a 'normal' Sunday as I'm going to be hitting the road soon for a day of driving, I thought I'd quickly update you all on my progress and hopefully get a chance this evening to catch up with everything.....gosh where has the week gone? The photos this week may seem a bit samey, but to be honest I am pressing forward with my Plain and Simple Sweater so everything else has gone on hold. .....well, actually I do, as I have finished the knitting on circulars and have now started the arm area which I will stick to having in blue, I am very scared about stuffing up the stripes I think the design will look better this way. New skill learnt, tagging on new stitches at the end of a row using a ridiculously simple method which looked like it would unravel, but seems to have worked.......youtube yet again to the rescue! I am sooooo hoping to get this finished, although I think looking at the week it may be wishful thinking.....we will see! 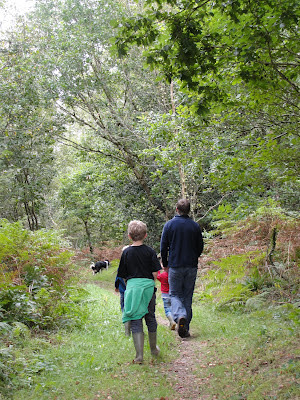 Just to round up, as I knew I wouldn't get my Sunday wood walk in this week, we did a Saturday wood walk instead. I can see Autumn creeping in on the colours.....I must do a mosaic of the wood walks as it would be interesting to see the subtle changes. Well.....I'm hoping that you've all had good crafting weeks.....so looking forward to sitting down a lot later today to do a huge blog reading session......its long overdue! 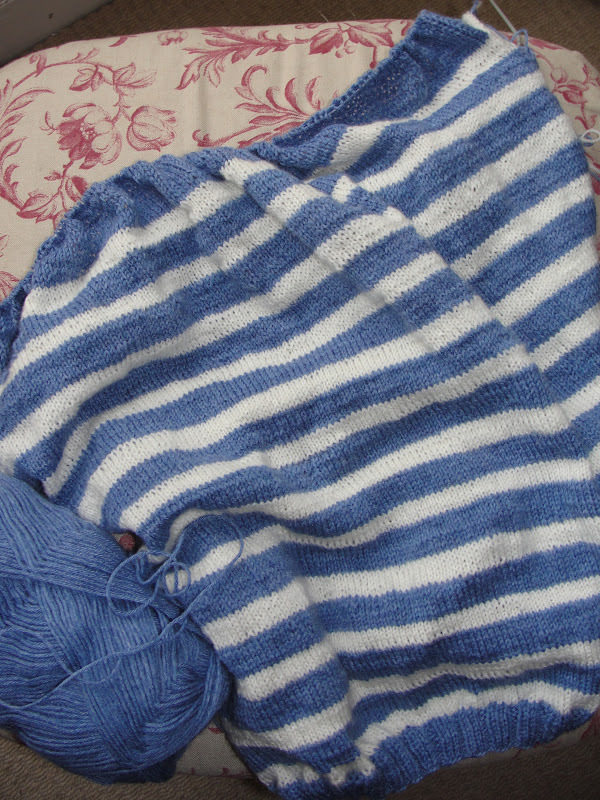 Inspired by you and the fact that I love Veera's designs I started knitting this plain and Simple pullover too. However I only had enough DK in my stash and after much to my horror and measuring my hormonal bust(!!) I went for the LARGE cast on of 294 stitches. Alas, it's waaayyy too big. I am contemplating buying the right yarn for this knit (not sure why I was being an idiot and tried DK?). Can I ask what yarn you are using and did you go for S/M/L when you cast one? Looking good so far Faith.I am starting to get my crafting mojo back again, think its the autumn looming thats done it! Great stripes Faith. They're so cheerful and upbeat. 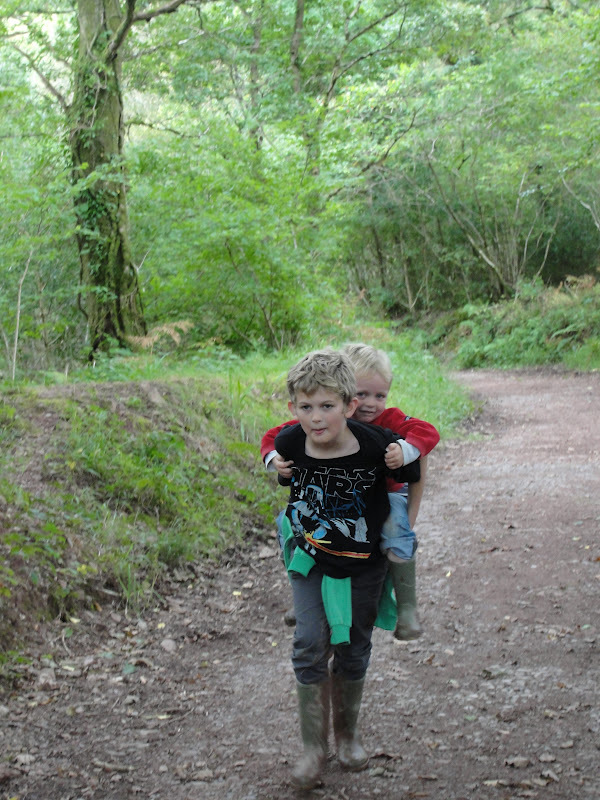 How smart to stick your boys in their Wellies while on a beaten path stroll. 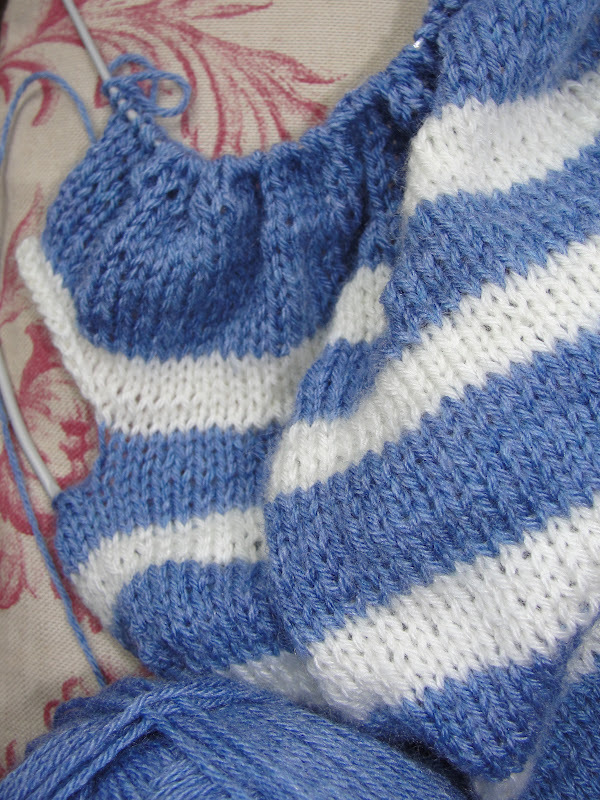 Beautiful stripes and that yarn looks scrumptious! I've been bad about visiting simply because there is much to do before Winter outside since it's finally cooled. Who's the sweater for? What is that yarn BTW? I want some! LOL! Have a safe trip to where ever and give those boys a big hug....I can never get over how cute they are! I wish we had paths through our woods like yours. Do you have snakes over there? We have lots here in AR and they hide under the leaves and so many are poisonous. I try to stick to the road mostly. I have to go check your projects and see what that sweater is and the yarn you're using. I always love whatever you do! It will look lovely with a solid blue yoke! Great design choice! Good luck on finishing the sweater. Looks like you are almost there. The picture of your boys is adorable! I too am waiting for the color changes fall brings. It is my favorite season. I'd love to see a mosaic of the season change..my favorite time of year..Really, what did we do before you tube? What a lovely place for a walk! I can't wait to see with all the autumn colours. Be sure to post photos. Beautiful photos Faith, you are making great progess on that sweater. Your comment about the picture looking "samey" gave me a chuckle. It's hard to show progress on WIPs sometimes. That sweater will be done before you know it! And I think blue sleeves will be lovely. I'm thinking that sweater is going to look fabulous! I would love to attempt my first sweater sometime next year, along with socks, bought myself some good reading material to help me, and with YouTube helping along the way, I think I will be ok...I know I have lots of frustrations coming up in a couple projects ahead of me but I am so enjoying my new KnitPicks needles and working on a friends beret that I really am amazed at how easy this project is going, I figured after 9 redos with the first yarn choice and 2 more yarn changes including swatches, that its about time THIS project...became easier and enjoyable...Loving it...Would love to see your mosaics! Enjoy your car day too! Your sweater looks great! I love those youtube knitting videos, I would have been completely lost without them sometimes. Your boys are so cute, love the last picture! Have a wonderful week Faith! That jumper is looking brilliant, good luck with the arms I bet they will look fantastic! I would still be sitting on the sofa with a ball of wool and nothing else if it wasn't for YouTube. I'm such a visual learner, I can read instructions and it goes straight over my head, but show me an example and I get it! Thank god for all the people who post the tutorials. I love that sweater, the blue is just a perfect shade. I'm not sure why I'm so attracted to it, but I want one in exactly those colours!